Uncategories Is waiving off loans the solution to the problem of farmer suicides? The statement of Reserve Bank of India Governor, Urjit Patel, describing loan waiver as a 'moral hazard', with regards to waiving of farmers' loans, might not have been liked by the government but it is not a matter of surprise as the person concerned with any issue relating to finances will give the same statement. According to Patel, with a loan waiver, the honest loan culture becomes weak and at the same time, the graph of loan returning comes down. Not only this, the demand for loan in future is increased and the same is available at a higher rate of interest. In all, Patel is of the view that with loan waiver, the health of the economy is disturbed. Moreover, it is not a good practice, morally. In fact, the statement of RBI Governor has come at such a time when the newly formed government in Uttar Pradesh has announced to waive off the loans of the farmers. Earlier also, a similar statement to this effect had been given by Arundhati Bhattacharya, Chairman of State Bank of India against the waiving of loans. Both these personalities attached with core banking systemsof the country have expressed concern on the issue that with loan waivers, the financial discipline in the country will be greatly disturbed. Earlier also such decisions have been taken. For example, in 2008, the UPA government had waived off the loans to the extent of around Rs. 70,000 crore. In 2014, Andhra Pradesh and Telangana governments had also initiated this step butat all times, the officials of finance administration had criticised the move, which is all but natural. Their apprehensions cannot be ruled out on this sensitive issue but it is not understood as to why such feelingsare not reciprocated by them when the loans of corporate houses are waived off. The NPA of nationalised banks has gradually reached serious levels and the lion's share is of corporate houses and industrialists defaulting on their loans, but unfortunately, hardly any action is initiated against them to bring them to book besides setting an example for others. Rather, the major share of dues from big corporate houses is put in the non-recoverable lists. In certain cases, a relief is given by restructuring of the defaulting organisations. But the problem is that even afterall this, the loans are not returned. Neither banks nor the governments make any hue and cry with crores of rupees lying in dues and on the contrary extend help to big defaulters from the government treasury out of the taxpayers' money, in the name of schemes. But when comes the question of providing relief to farmers, out come the rules booksof these financial advisers. Over three lakh farmers have committed suicide in India since 1995. A majority of them were concentrated in five major agricultural states of the country – Maharashtra, Madhya Pradesh, Andhra Pradesh, Karnataka and Chhattisgarh. 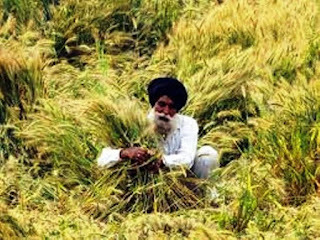 Even Punjab recorded a high number of 449 farmer suicides in 2015, next only to Maharashtra. Farmer suicides have been steadily increasing over the years. On an average, around 15,400 farmers ended their lives each year between 1995 and 2003. This number increased to more than 16,000 between 2004 and 2012. There is no doubt that our agrarian community is facing a crisis. But questions arise on the exact nature and reasons behind the deepening problem. Farmer suicides have largely been attributed to debt, drought, crop failure or poor returns. However, Indian farmers have been taking the drastic step regardless of a good rainfall year or bad, a good price year or a disappointing one. But why? Several socio-economic factors have enabled an environment vulnerable to distress in the agricultural belts of the nation. And drought, crop loss or price crashes only exacerbate the existing plight of farmers. According to the National Sample Survey Organisation's (NSSO) 2013 report, agricultural households made an average monthly income of Rs.6426. Their monthly expenditure during the same period was Rs.6223. Forget paying off debts, they barely make enough to feed themselves. But with such low incomes and high costs of cultivation, their main source of capital for farming remains loan. And their main sources of loan are moneylenders. As they try to break-even and somehow pay off their debts with exorbitant rates of interest, a weather shock or price fluctuation will push them into yet another cycle of borrowing. Unable to cope with mounting debt and the inability to take care of their families, many choose to end their lives. Besides economic, there are other reasons to be considered as well. In a report on agricultural indebtedness, R Radhakrishnan notes that though debt is the main cause of farmer suicides, others include social disrepute, health problems, addictions, marriage in the family, disputes with others etc. In fact, many of the farmer loans are for marriages. It is a social obligation to spend well on weddings, which sometimes even includes dowry. Another pattern noticed in farmer suicides is more than 80 per cent of them are male suicides. This probably has to do with the fact that the role of breadwinner is traditionally that of a man's and the incapacity to fulfill that role adds to their mental stress. Successive governments have focused more on control rather than prevention. It will take more than short-term measures and disproportionately implemented programmes to wade through the crisis. The wave of farmer suicides that hit Marathwada last year could have been avoided if there was a proper irrigation system, weather forecast information, competent crop insurance and buffer stocks in cold storage facilities to distribute to the families in their time of need. Frankly speaking, no doubt our financial experts and economists are worried over financial discipline but they must think it over impartially. Our politicians too have to think it over as to whether waiving off loan is solution to the problem or not? With the recent decision of waiving off loan in UP, the issue is also being raised in other states on the same pattern and even in the Rajya Sabha. The major reason behind the suicides by the farmers in the country is their inability to repay the loans and waiving of their loan can be viewed from different angles and circumstances, keeping in view that they are always compelled to take loan and not in a position to repay it. It is because of the fact that agriculture profession is now not a profitable business and agricultural experts too have to come forward to give their expertise to advise the farmers to cultivate only those crops whose marketing is possible in the particular region. A concrete reorientation of policy is crucial to stopping this depressing trend. Farmers in the country are desperate for help. But taking their own lives isn't the answer, a nationwide farmer movement to demand for reform is besides doing counselling of farmers to make best use of their loans strictly for the purpose for which it has been obtained.